SONY MDR-ZX300 STEREO HEADPHONES. STILL GOING STRONG.JUST LESS HAIR! HARD TO FIND IN NEW & ORIGINAL STATE. FOR SALE IS A NEW AND SEALED SONY MDR-W08L ACTIVE IN-THE-EAR STYLE STEREO HEADPHONES. Go vertical with the MDR-W08L vertical, in-ear headphones. Sony MDR-W07L Ultra-Lightweight Verticle In-Ear Headphones New In Box 90's Rare! Sony MDR-W07L Ultra-Lightweight Verticle In-Ear Headphones New In Box 90's Rare!. Condition is New. Shipped with USPS Priority Mail. Box has some storage wear to it from over time These are super rare! If any questions or concerns feel free to contact me. SONY Headphones MDR-W08L Vertical In The Ear MDRW08L New VTG Original New sealed! 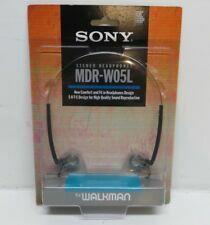 SONY MDR-W08L LIGHTWEIGHT STEREO HEADPHONES FOR WALKMAN MEGA BASS-SEALED. Condition is New But the package has some wear and rips. They are pictured above. Sony Ultra lightweight stereo headphones. Open-air, dynamic headphones which fit comfortably in the ear. Slim headband to keep headphones snug,Connectors: 1/8" Right Angle Stereo Mini Plug. About the item: This item is associated with the following MPN(s): MDR-W08L, 3-240-449-11. Sony Extra Bass Bluetooth Headphones, Best Wireless Sports Earbuds with Mic/ Microphone, IPX4 Splashproof Stereo Comfort Gym Running Workout up to 8.5 hour battery, black. Enjoy Bluetooth wireless connectivity with NFC one-touch pairing. In Ear Stereo Headset. Tested and is fully functional. Adjustable headband. Sony MDR-W014 Sports Headphones. Very good condition. Sony MDR-W034 Headphones. Tested: Both Ears Functional/Sound great. Good Condition/Minor signs of use. 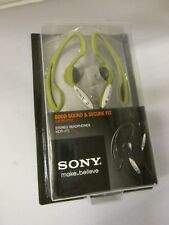 Sony MDR-W08L Headband Headphones Black - New/ Factory sealed year 2002. Sony MDR-W08 Headphones. Tested: Both Ears Functional/Sound great. Good Condition/Minor signs of use. I am not responsible for what might happen to the electronics part/s after the item is received in the working order described. Tested and working properly. In overall nice condition. Cost will be calculated based on your location. Condition is Used. Have been tested and functions properly, perfect condition. Sony MDR-W10 Headphones. Tested: Both Ears Functional/Sound great. Good Condition/Minor signs of use. Listen to music for hours together with the Sony MDR-W08L headphones that snugly fit in your ears with the vertical in the ear design. Get optimum sound performance without any corrosion with the nickel-plated mini-plug of the Sony MDR-W08L headphones. Fit Design Over Head. Type Headphones. Earpiece Design Over Head. Manufacturer Color Black. MPN Does Not Apply. In 2008 the year The Who had a. hard to find records and new Japan cds. Our specialized fields are in rare Japan. 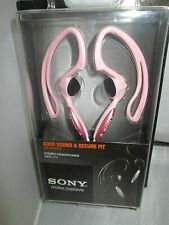 Sony Sports S2 Walkman Headphones. Add style to your next sports challenge with Sony's MDR-A35G Sports Headphones. Designed with the new Sports Walkman Line in mind, these headphones are up to a physical challenge. 30 Days Money Back Guaranteed Free Fast Shipping!! There is nothing more than what is in the photos. No other parts are included unless specifically stated. Sony Premium Noise Cancelling Wireless Behind-Neck In Ear Headphones - Gold (WI1000X/N). Battery life up to 10 hours (with wireless noise cancelling). Digital Noise Cancelling with Atmospheric Pressure Optimizing – perfect for flying. Lightweight Headband. Warranty & Support. Short Cord with Detachable Extension. This warranty covers the unit for any manufacturer defects. Shape Headphone head band. Noise canceling correspondence. Color black. Head band type. You need to get an import permit from Ministry of International Trade and Industry tog get your item if your item is more than 1000 MXN. Type: Headband, Stereo / Monaural: Stereo, Structure: Sealed, Noise canceling: Not supported. Maximum input: 1500 mW. Condition ：USED GOOD. Sony WF-SP700N Premium Noise Cancelling Wireless Earbuds : White. Unit in Excellent Condition. Adjustable loop hanger prevents headphones from peeling off during exercise. Impedance: 16. Sensitivity: 104dB / mW. Frequency response: 17Hz - 22000Hz. SONY MDR-W014 Vintage Yellow Sport Adjustable Headphones. Condition is Used. Shipped with USPS First Class Package. Warranty period is complied with manufacuture regulation. I would appreciate your understanding. We would appreciate your understanding. We do our best to resolve your problem. Back to top. Realize the heavy bass of the base booster adopt powerful. For your consideration is A pair of Sony MDR-W014 Headphones. Sony Extra Bass MDR-XB450AP On-Ear Headphones with Mic (Blue). Sony MDR-XB450 On-Ear EXTRA BASS Headphones (Red. 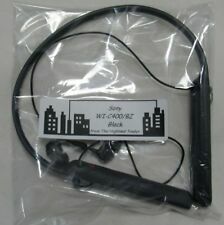 In-line mic for hands free calling. 30mm dynamic driver unit for powerful extra bass sound. ). Sony MDR-W014 Headphones MDR-W014 lightweight headband(SONY MDR-W08 Style). Condition is Used. Shipped with USPS First Class Package.